Beautiful fall has arrived and we can’t be any more inspired than this! It is the season of warm colors, fallen leaves all around, warm beverages, the smell of cinnamon… The list can go on and on. 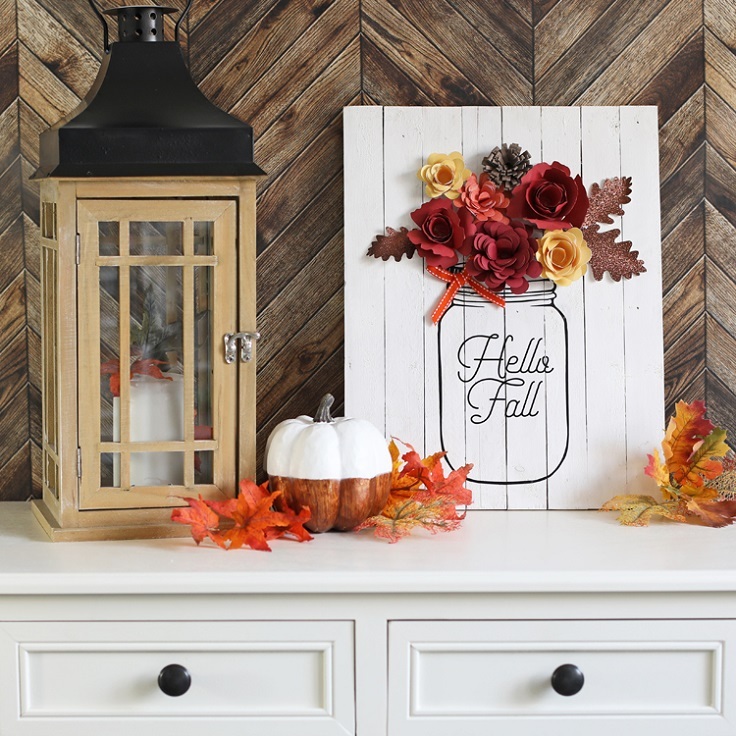 What is really amazing about fall is that this inspiration can be taken inside our home and used for creating the perfect little decor. When it comes to DIY projects, some will require some sort of skills and others won’t, so in this list that we prepared for you, there will be something for everyone. It takes just a little time and a small amount of money to come up with a creative home decoration, so why not go ahead and create something on our own? The first decoration on this list is also one of the easiest. No skills are required and most likely you already have the needed materials. If you have an old vase that you want to reuse, wash it well and fill it with pinecones. 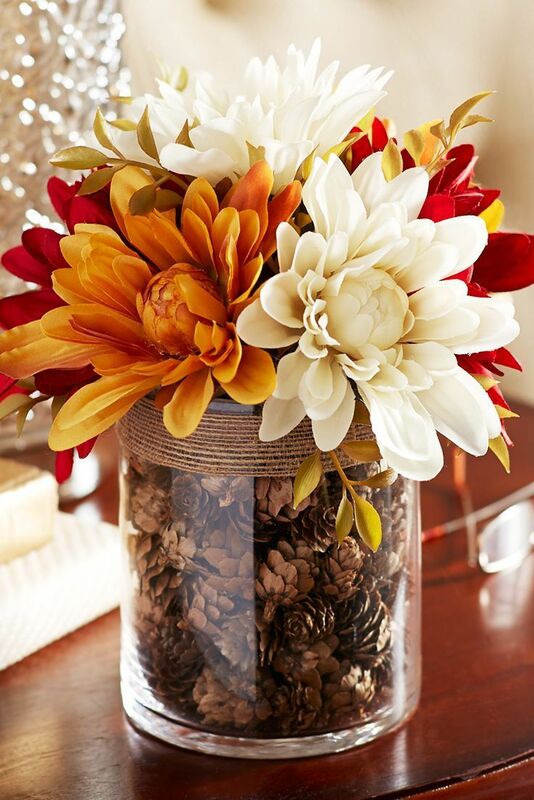 Add your favorite fall flowers and voila! To make it more practical, you can use fake flowers and for more decoration, how about adding some burlap details to your vase? Creating your own centerpiece is such a fun activity! There are so many things that you can use and the whole arrangement is very fun as well. What reminds you the most of fall? Gather all these things and arrange them in a tray. 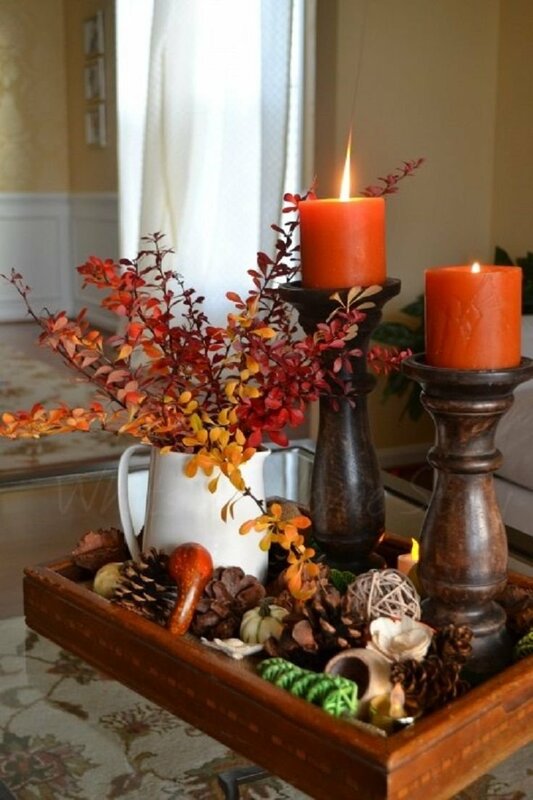 For example, you can place a small vase with fall flowers, pinecones, candles, leaves, or even fruit such as small pumpkins and apples. Wow, with a sign such as this one, you will never want for fall to leave! This is such an adorable decoration that would perfectly fit in every room, and it is also a quick and easy way to add an amazing decoration into your home. To make your own mason jar sign, here’s what you need: pallet wood sign, white craft paint, paintbrush, silhouette cameo craft cutting machine (or similar), cardstock in fall colors, black adhesive vinyl, transfer tape, hot glue gun, and glue sticks. With such beautiful leaves all around us during the fall, it would be a pity to not use them and create something very beautiful for our home. 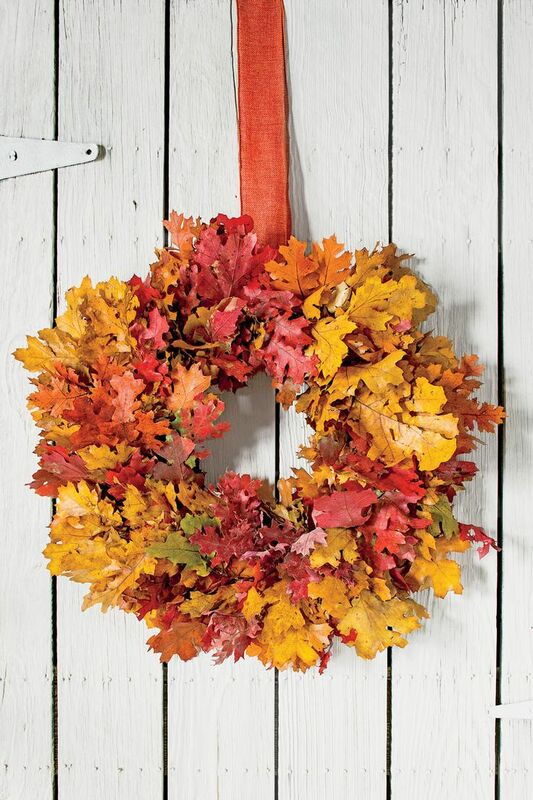 For this DIY project, you need to get these tools and materials: hand pruners, 12 branches of fall leaves, a 5-gallon bucket of warm water, 2 cups liquid glycerin, food coloring (if desired), florist wire, wire wreath frame, wire snips, and 2-inch-wide orange ribbon. Taking care of the wreath is easy, but there are some things to note here. Blow off the dust with cool hair dryer and store it in a plastic bag, in a dark place. This fall sign is absolutely one of the most beautiful signs we have ever seen! If this doesn’t welcome fall, then we don’t know what would! This DIY craft is fun, budget-friendly and easy to make. 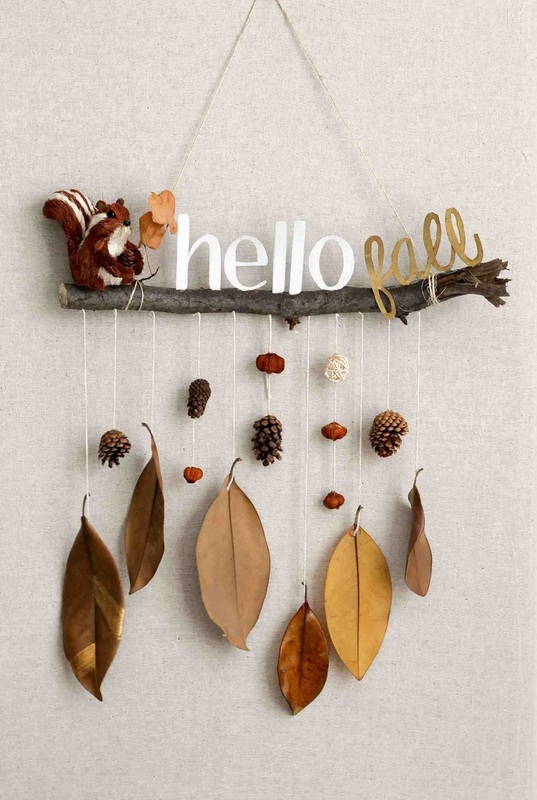 To make your own sign, you need small branches, pinecones, leaves, nuts, hot glue gun, string or twine, printed “hello fall”, cardboard, white and gold paint (or any other color that you like to use), scissors, and small squirrel ornament. If you like working with felt, then this is the perfect craft for you. 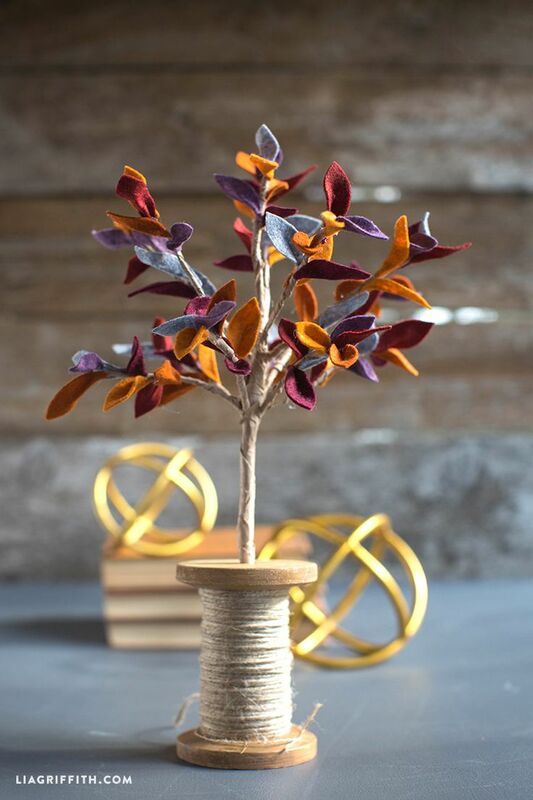 Creating a felt tree might feel difficult at first, but with the right tools and some patience, you will have your brand new decoration in no time. For this project, you need felt in fall colors, scissors, hot glue gun, wire cutter, kraft paper, and 12″ wire. Once you have it all done and ready, you can place your felt tree in any room! If you’re a book lover or have a dear person who is, then the ideal gift would be a bookmark. Even though it is homemade, it doesn’t even look like a lousy DIY craft, but rather something very nice and useful. For this project, explore your area, enjoy the fall and get some leaves – make sure they’re different and in good shape. 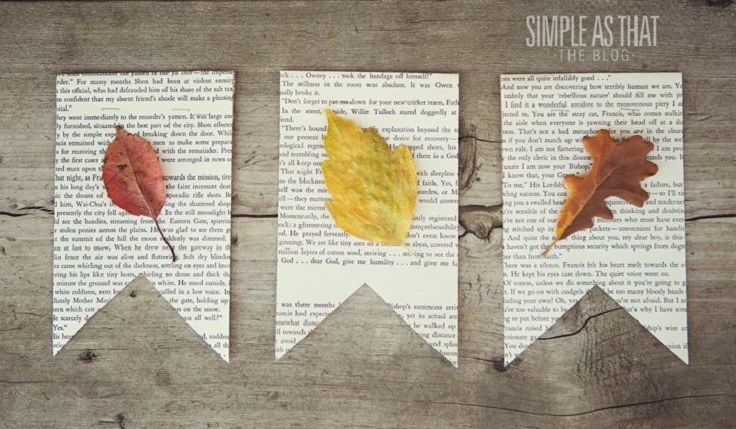 You will also need book paper you can use for the project, and a staple or glue to secure the leaves. Creating a magical, rustic atmosphere is easier than you can imagine. Old wagon wheel with Christmas lights on it isn’t something you get to see every day, but this is the kind of decoration you need if you want something that will definitely make a difference. 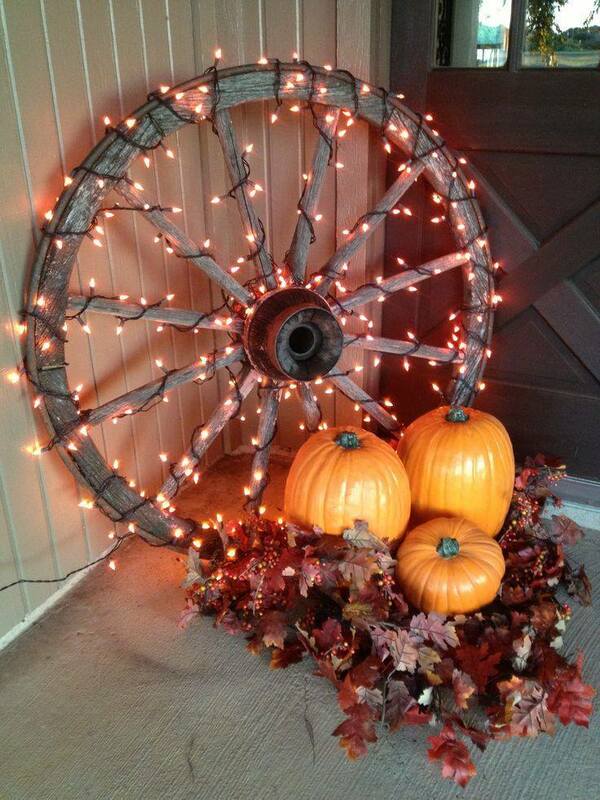 To make things even more rustic, you can add pumpkins and leaves around the old wagon wheel. We’re back at the inspiration from the autumn leaves, but this time it isn’t about real fallen leaves, but artificial ones. 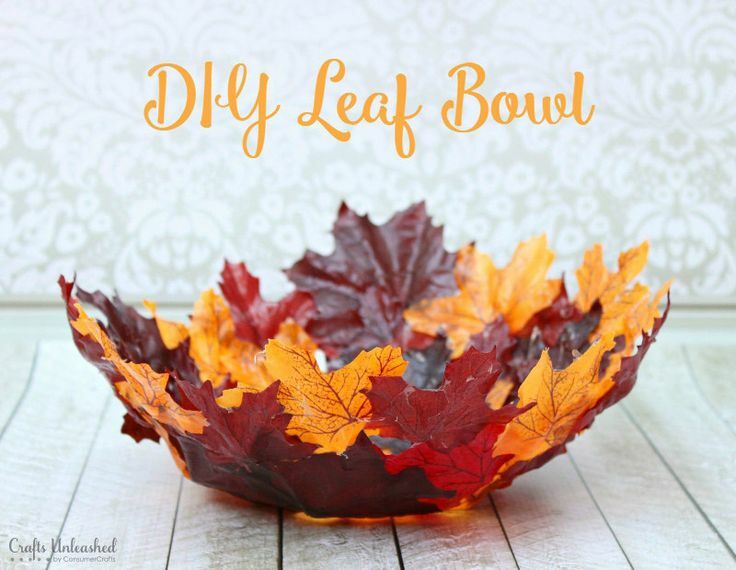 Here’s what you need to make your own leaf bow besides the artificial maple leaves: plastic bowl, Mod Podge Matte, Krylon triple thick glaze and plastic wrap. This is a small detail that will make a big difference to any room. It’s very simple and budget-friendly project so don’t miss out! If nothing on this list didn’t convince you that is an easy project, then the last one on the list is something you can literally do in few minutes, as long as you have the required items. 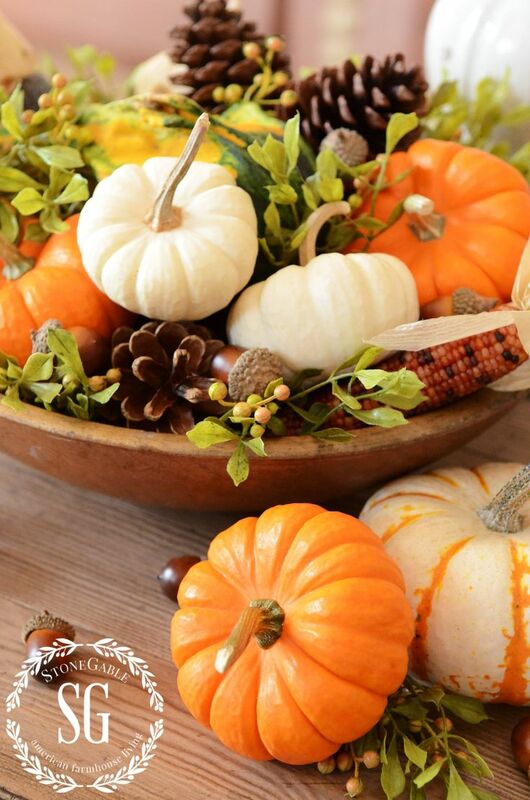 For this project, you need all kinds of fall items, such as mini pumpkins, leaves, branches, corns, nuts, pinecones, whatever that comes on your mind! Arrange them all in a big bowl and place it on your table. You can also leave out a few of the items and arrange them around the bowl.